I have no idea what those Chinese characters mean! There’s about 1 million people in the world who speak my native tongue (I was born in Estonia). It’s a tiny country. You’ll need another language after driving for 3 hours. So make sure you have good luck being born in the right place! Estonia was occupied by Soviet Union before I was born and learning Russian in school was mandatory (despite the fact that there were no Russians to talk to in my hometown). You’ll get one more language for free if you just make sure your country gets occupied, so make sure you do that! The only radio signals that made it through the iron curtain were from Finland. Deprived of western media, we sucked in every bit of media that trickled through, and in the process, many of us acquired the Finnish language. So get censored! One more language in the basket! When the Berlin wall fell and censorship ended, we could suddenly watch anything from the sky (satellite television) — as long as we could afford it! That pretty much only meant free German channels. Let’s just say I watched TV a LOT! So make sure there is an immense void of consumerism in your heart and lack of resources to pay for media in your language of preference. Another language nipped in the bud! Go study a Master’s program in English, but pick a place where 95% of the students are from a non-English speaking population and keep forgetting that it’s an international program. That’s how I acquired Swedish. It’s got to work for others! By now you must have realized that NONE of these instructions can be followed. Offering secrets to learning languages is kind of like teaching someone how to get rich. There are a lot of lucky people out there trying to tell you what to do and thinking that repeating what they did will work. Survivor bias at its best! 1. Take as many shortcuts as you can! Most of the language out there is spoken. It’s only a small fraction that gets written down. Don’t waste your time learning parts of the language that you do not need! For example, despite the beauty of Chinese calligraphy, it’s easy to argue that their semiotic system is far from practical. If you can encode the same information in two dozen letters, then why would you spend time learning thousands of characters? After 3 years of agonizing learning, you’ll surmount to an impressive level of a Chinese preschooler and you’ll still be having trouble with basic conversation. You can learn to speak Chinese by using a Latin alphabet based transcription called pinyin and spend all that extra time that others spend learning strokes on improving your conversational skills. 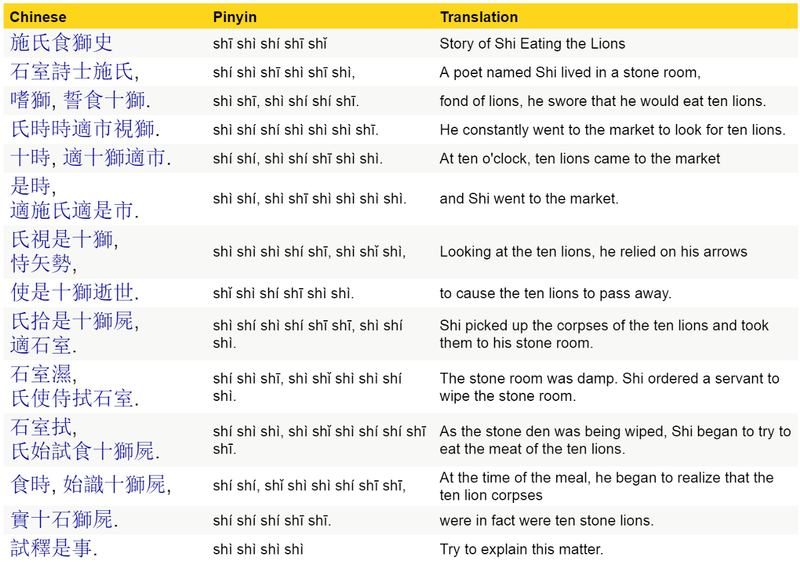 It’s a good shortcut if you only care about speaking Chinese. My native tongue is phonetic (sounds like it reads), which is why I’m taking my dysgraphic protest even further. Every time I write beaucoup (many in French), it hurts! It hurts so much, because it actually only requires 4 letters to write down the phonetic form ( that’s 100% overhead for redundancy to write in French ). Sacrebleu! Why do they need to use so many freakin’ letters?! I know this will strike many as ignorance, but I am quite capable of carrying a conversation in both Chinese and French without having the slightest clue of how to write either. As a computer scientist, it puzzles me why someone would encode redundancy onto a noise free channel (whad’up Shannon!)? Having extra sounds in spoken language certainly makes sense as you might not hear everything because of noise in the environment and all the extra information (sounds) will help your brain reconstruct what was said even after some of it gets lost on the way. But on paper? - Where’s the loss? What’s with all the extra letters? Unless you’re applying for a job that requires written command of the language, the chances are you can get rid of a lot of cognitive overhead by skipping parts of the language that you don’t need. Plus, I’ve yet to see someone impress others by pulling out a notepad and writing down some error free words! Do your goal-factoring and try to understand why you’re learning a language! It’ll give you insight into what type of shortcuts are available. In principle for many events, roughly 80% of the effects come from 20% of the causes. This is known as the Pareto principle or the 80:20 rule and it also applies to languages. A small portion of the vocabulary makes up the majority of the language use and you can take advantage of that by learning new vocabulary in the right order. 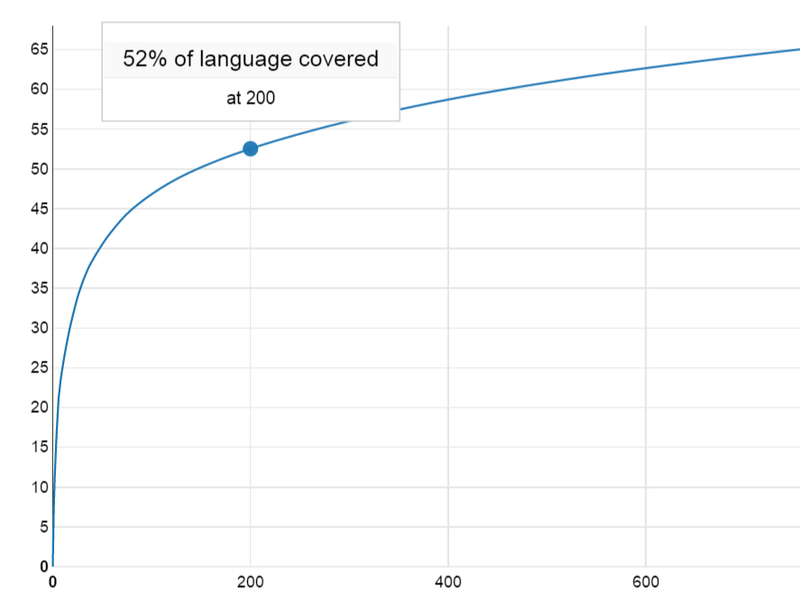 To illustrate this, I took the most frequently used words in the English language from the Google Corpus Data (thanks Peter Norvig for the counts) and constructed the cumulative coverage graph for vocabulary acquisition. After learning 200 most frequently used words in English, you’ve captured 52% of the written language. The effect is even further amplified in spoken language as the word use is much more limited. The coverage of course doesn’t translate 1:1 onto usable skills, but it’s nevertheless a good proxy to why learning order matters. 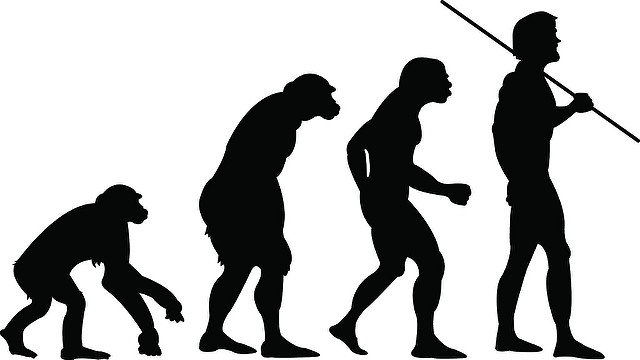 On the evolutionary scale, humans have spent way more time roaming around in nature than learning each others languages. As much as we’d like to think that we are sophisticated analytical beings, the reality is that most of the time we’re primitive pattern matching computational wetware machines operating on auto pilot as we try to avoid the majority of the cognitive load that the environment throws at us. Understanding the limits of our biology offers insight into language learning. I had an epiphany regarding language learning when I read “Moonwalking with Einstein” by Joshua Foer. In the book, Joshua describes the world of memory champions and the techniques they use to pull off feats such as remembering the order of a few randomly sorted decks of cards etc. I even reached out to Ed Cooke (one of the memory champions from the book) and Greg Detre from Memrise in 2012 as I thought their initial attempts to capture similar learnings in software where quite impressive. They never got back to me though and I mostly kept the theory to myself, but recently I’ve been reminded of the language learning topic so often that I decided to share it for what it’s worth. I also ran into Benny Lewis (Fluent in 3 month guy) at a conference in Bangkok and shared my insight and he seemed intrigued, but also failed to get back to me. I think it’s time to put this idea out there in the hope that someone will get ideas for how to improve language learning software. Language acquisition can be improved by re-encoding language information for the senses that most influenced our survival throughout evolution. Firstly, humans are very good at processing visual information (we have a large visual cortex). We survived better because we saw better (a blind person has a lower chance of survival compared to a deaf person). Hey — we even stood up so we could see further! A lot of the mnemonic techniques revolve around coming up with images to represent words. In essence, by finding images that help us recall words, we can shift some of the cognitive load onto parts of the brain that have had more time to evolve (and become better at their main function). Secondly, by roaming around in nature, we developed a remarkable sense of space. We have dedicated machinery in our brain to interpret the position of objects around us and we can tap into our spatial memory to help us remember things. This method is referred to as the method of loci (“places” in Latin) and in essence just teaches you to imagine familiar locations and place objects (images) onto the scene. These methods will help you remember even the order of objects as you can easily visualize walking around in your space and recall objects even in the reverse order if needed (just walk the other way). Thirdly, what kept us alive in the past was noticing stuff that is outside of the ordinary. Things that stay the same merge into backgrounds and our brains filter them out. Noticing things out of the ordinary saved our lives! Was that movement in those bushes or is the predator just happy to see me? Joining together these insights can result in remarkable improvements in your ability to recall. For example, when trying to remember the word banana from a long list of words you can either imagine a regular banana on a table where you are used to seeing it, or you can imagine a half-peeled bleeding banana hung from your desktop lamp swinging and shouting orgastically. I know it’s disturbing, but which image do you think will stick in your memory longer? And yes, we were quite biased towards reproduction throughout evolution as well, so throwing in those senses in addition won’t hurt. There are many more methods and exciting tricks to learn, but if you want to know more I really do recommend Joshua’s book. The main point is that the better you are able to incorporate different senses into the memorization process, the higher is your probability of recall. All in all I believe there is a lot of opportunity in language learning that takes into account the science of who we are and where we came from. In fact, recently, my friends (ex particle physicist from CERN, ex head of Skypes core engineering team and an ex financial specialist) received $8 million dollars from Rakuten to help Japanese people learn English with their state-of-the-art language learning software that is scientifically driven. And this is just the beginning! I’m really looking forward to what scientific methods (like spaced repetition etc. ) can do to our rate of learning and I’m happy to live through the success of my friends as they progress with their startup that I never got around to founding. Everything I’ve talked about so far has to do with the slow and painful process of language acquisition where you engage your analytical brain (System 2 in Kahneman’s terms). It’s a slow and exhausting process, but a necessary first step in learning a new language. The fun, however starts when you your newly acquired skills start becoming automatic (or get mapped to your System I). I have yet to come across a method more efficient at forcing that transition than full immersion. Last Christmas break, I started learning Spanish. I spent 2 weeks using Duolingo (sorry Lingvist, you guys have no Spanish yet!) and then I moved to Colombia. Not because I had to, but because I wanted to. And one of the biggest reasons for choosing Colombia was to learn Spanish. I’m not going to lie to you, the beginning was tough, but because most people in Colombia don’t really speak English, then I was forced into making progress fast. In March, I moved to Galápagos Islands in Ecuador. After a total of 3 months in South-America, I felt comfortable saying that I speak Spanish. I’m not sure I’ve ever gotten to that point with any other language so fast. Freedom to move translates into applicable language skills faster than anything else I’ve ever tried! If you have a passport that doesn’t restrict your freedom to move and you want to learn a new language — start with language learning software and then just move! That’s what I call the Teleport Method! 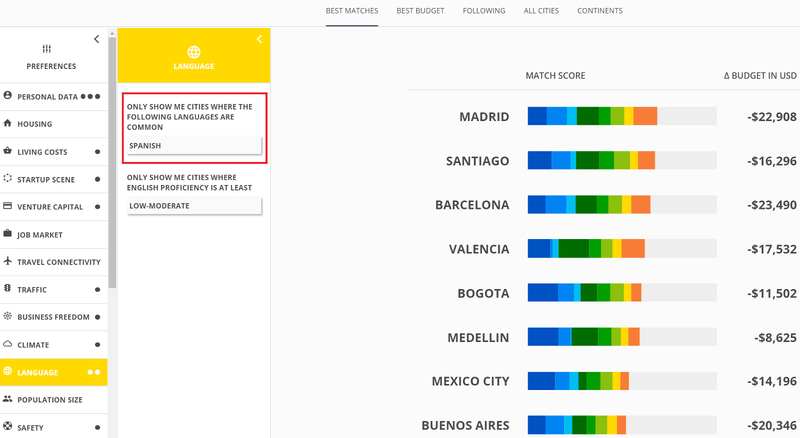 You can figure out where to go by filtering for “Language” in Teleport Cities. I’ve moved eight times by now and with the Airbnb’s and Uber’s and all the new technology, it’s starting to feel as easy as going to a language class. Grab your laptop and off you go! Learning which language do you think would help you learn other languages better? But to conclude my rant, I speak more languages than your average guy, because I speak the language of computers and computers gave me the freedom — the freedom to go anywhere and learn anything! Pick your next language and join me! p.s. Please click the heart below if you like the post and want to fuel my writings!